A detailed study of Organic vs. Paid Search Ranking. When we type something in the search box, the search engines find the sites based on the two types of rankings: organic and the paid one. The organic-based ranking shows the sites which matching to a user’s search query based o the relevance. This is also called the natural ranking, as all the SEO terms and theories are developed and implemented on this specific functionality. On the other hand, the paid ranking or the paid results are the web advertisements for which their owners have paid the amount to the search engines. These web advertisements are listed on some certain keywords; when they are matched with the users’ queries, the search engine displays them with a priority. It is very easy to distinguish between the both types of results and rankings when observing the SERPs. Now the question is which of them is really useful? These both have their own importance, relevance, and worthiness. While the users know their differences and suitability with the object, they can easily get the best out of both types of results. For example, while the paid results are actually the advertisement material, it has a notable importance for a shopping searcher instead of an information seeker or a researcher. While the search results display both ranks with a great priority, maybe you get confused about these two. It sounds a simple question that which is a better one the organic search marketing or its paid version, but the answer is more difficult and complicated. Both Organic and Paid methods have their own specifications and limitations which apply differently to the different niche of subjects. It is very essential to understand their prime variations and their best access to get the best out of these two types of rankings and you can expect the maximum return on your efforts and investments. In the organic search ranking, the search engine presents the results on the base of the search algorithms which clearly match to the search strings of the requested keyword. The webmasters and the content marketers invest a great deal of research, time and effort along with SEO tactics to get this higher organic ranking and visibility in the top five rankings. The method has both the advantages and disadvantages, but all of them highly depended on over the top visibility of the site. And if the list is not visible on the first page, nothing does the matter. Trustful and credible: The top organic ranking can be earned through a great effort and fulfillment of the strict guidelines of the search engines so they imply the industry authority and leadership. All this results in users’ trust and belief in the sites. Long lasting: While your subject matter is a long-term issue, and you have done a great job while crafting a valuable content, your ranking will always be in the top visibilities. Keep up the rankings: Once you have managed to achieve higher rankings, it is now less difficult for you to maintain these rankings. With an evergreen content and quality work, you further get the authority status and the trust of both the search engines and users. Click through rates: The click-through rates are ideal for organic ranking. While you are engaged in a business with a longer buying cycle, it is very important for you. Inbound marketing: In order to earn the top organic ranking, a webmaster has to develop sound content assets that are also vital for higher involvement purchases. Audiences interact with this content as the go through the purchase funnel. Time: As the method relies on the competitiveness of the keyword phrases covered in the content, you have to wait for a long time to get a higher ranking. Sometimes your business cannot afford this delay. Resources: Earning the high SERPs ranking, requires a good amount of content creation ability, skill to apply the SEO tactics and a team of internal staff to deal with it. These are actually the advertisements enriched with some specific keyword phrases. A businessman arranges their display just above and right of the organic search results, by paying a good amount to the search engines which is determined as per the bidding process and the quality score. Time: Just opposite to organic rankings, you can place your Ad at the top of the SERPs by paying the determined amount, just after its launch. Target oriented: The paid Ad campaign is crafted according to your target audiences based on different income levels, marital status, education, age and many others. Cost: while you are dealing with a highly competitive keyword, you will certainly have to pay a big bid amount for the per click on the displayed ad. To manage the paid Ads campaigns often demand an expert level management. In the absence of it, the money you have spent will not give any productive result as it has been spent on attracting the unqualified traffic. Momentary: No matter, you have crafted a great advertisement material, once, you stop paying for it, the Ad will be disappearing from the search result page immediately. The trust factor: It is the biggest disadvantage of the method. Udders and audiences often don’t find the paid ranking trustful and tend to avoid them. The organic results, simply earn the trust of the visitors. So, which is the better one Organic Search or Paid Search? The experts suggest the both. 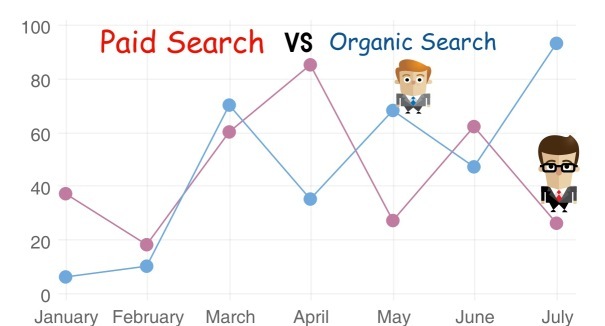 A business should apply both approaches of organic as well as paid search and rankings. While organic ranking empowers the business with audiences’ trust and credibility and long-lasting presence in the search results, the paid results ensure its better visibility on the SERPs, till the SEO tactics start to work and reach to the top visibility. With the strategical combination of both methods, a business can ensure the short term and long term success at the same time.